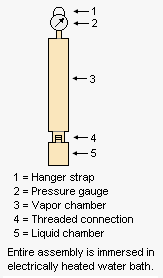 RVP apparatus for gasoline and other petroleum products having a vapor pressure below atmospheric pressure. Reid vapor pressure (RVP), determined by the ASTM test method D323, is widely used in the petroleum industry to measure the volatility of petroleum crude oil, gasoline and other petroleum products. It is a quick and simple method of determining the vapor pressure at 37.8 °C (100 °F) of crude oil and petroleum products having an initial boiling point above 0 °C (32 °F). The adjacent drawing depicts the apparatus used for measuring the Reid vapor pressure of gasolines and other products having a vapor pressure below atmospheric pressure. The liquid chamber is filled with a liquid sample that has been pre-chilled to a temperature of 32 to 40 °F (0 to 4 °C) and then the liquid chamber is very quickly connected to the vapor chamber fitted with a pressure gauge. The entire assembly is then hung by the hanger strap so that the assembly is immersed in an electrically heated water bath. After 5 minutes, the assembly is removed, shaken and the pressure gauge is read. The assembly is then re-immersed and after another 2 minutes, it is removed, shaken and the pressure gauge is read again. This procedure is repeated until two successive readings are within 0.05 psi (0.35 kPa) of each other. For more information, see: Gasoline. Vapor pressure is an important physical property of volatile liquids. It is of critical importance for automotive and aviation gasolines since it affect the starting and warm-up of spark-ignited internal combustion engines as well as the tendency to cause "vapor lock" in the fuel pumps with high operational temperatures and/or high altitudes. Air pollution regulatory authorities mandate maximum gasoline vapor pressures in many areas so as to limit the evaporative emissions of smog-forming hydrocarbons from gasoline. Vapor pressure is also important as an indirect measure of the evaporation tendency of volatile petroleum solvents. True vapor pressure is referred to in the petroleum industry as TVP. Both the Reid vapor pressure (RVP) and the true vapor pressure (TVP) are absolute pressures as distinguished from gauge pressures (see Pressure). Because of the presence air (and its of water vapor content) in the vapor space within the test method's sample container, as well as some small amount of sample vaporization during the warming of the sample to 37.8 °C (100 °F), the RVP differs by a small amount from the TVP of the sample. RVP values may be converted to TVP values using the nomograms or the equations provided in Chapter 7 of the AP 42 Compilation of Air Pollutant Emission Factors published by the U.S. Environmental Protection Agency and available online. Test method ASTM D323 is not applicable for liquified petroleum gases (LPG). ASTM D1267 or D6897 should be used for LPG. ASTM D323 is also not applicable for gasolines containing oxygenated compounds other than methyl tertiary-butyl ether (MTBE). For gasolines containing other oxygenated compounds, refer to ASTM D4953. The International Organization for Standardization (ISO) has a test method, ISO 3007:1999, that is the equivalent of the ASTM D323 test method. Many European countries use that standard or have their own standards which are generally the same is the ISO standard. The Japanese Industrial Standard JIS K2258 includes the equivalent of the ASTM D323 test method. ↑ Béla G. Lipták (Editor) (2003). Instrument Engineers' Handbook: Process Measurement and Analysis, 4th Edition. CRC Press. ISBN 0-8493-1083-0. See page 1595. ↑ AP42, Chapter 7, Section 7.1 On pdf pages 54-56 of 123 pdf pages. All units are U.S. customary units. ↑ For more information about MTBE, see Gasoline. This page was last modified 01:28, 21 September 2010.